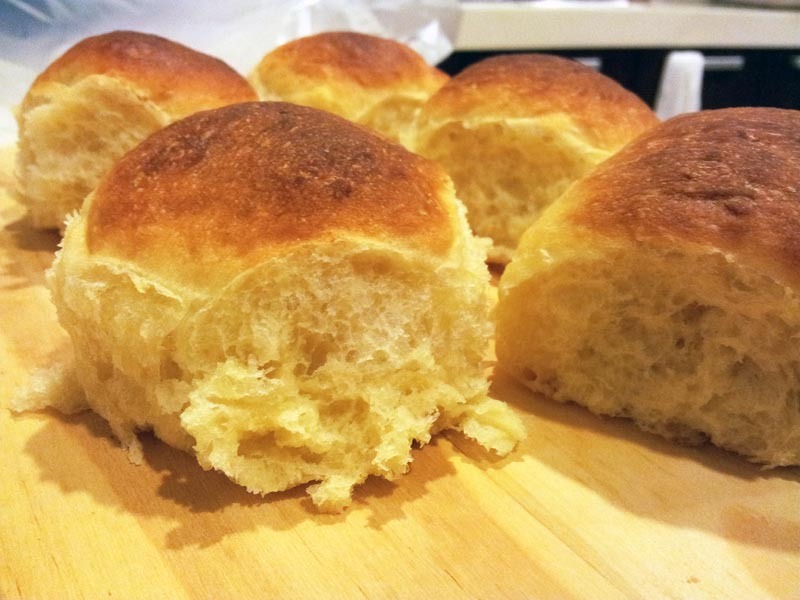 Generally, Asian bread and Western bread are quite different to each other, don't you think? Asians seem to like soft, white, slightly sweet bread. In comparison, Westerners like more wholesome, grainy breads with harder crusts. After having successfully baked a couple of wholemeal loaves for mom, I became more confident of my baking skills and wanted to bring something to work for my colleagues. As they are Barcook Bakery fans, and I have never seen them eating bread from, eg. Swiss Bake, I knew they would want soft white "shreddable" buns, and would not care for wholemeal buns, let alone organic wholemeal buns. 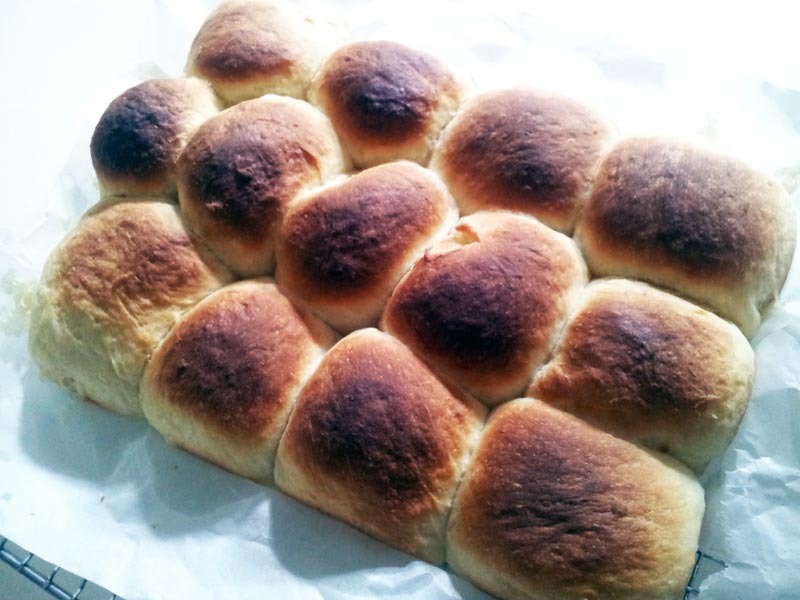 After stumbling upon a receipe which was used to make Hei Bee Hiam buns, I decided to just try it plain. Making the dough was fast, but shaping was difficult because the dough was so sticky that I had to keep dusting it with flour. The end result was as good as I expected though: soft fluffy white shreddable buns! 1. Mix (A) in a bowl. Let it cool to room temperature. You can cover with cling wrap and store in the fridge for 12 hours if you like. 2. In another bowl, mix the bread flour, plain flour, sugar, salt, egg and water, and knead the resultant dough for about 2 minutes. 3. Add in the instant yeast and knead for another 3 minutes. 4. Add in the cold slivers of butter and continue kneading for about 5 more minutes and until you pass the windowpane test. 5. Put the dough in a lightly oiled bowl, cover with cling wrap and let it rest for 45 minutes. 6. The dough will be very sticky, so lightly flour or wet your hands, and divide the dough into in small balls. You should be able to get 12 balls of about 40g each. Roll the balls and proof for 10 minutes. 7. If you are going to add fillings to the buns, flatten each ball with a rolling pin, place the filling in the centre, and wrap and seal the edges of the dough to form a ball. 8. Let the balls proof for 1 hour. 9. Pre-heat your oven to 200 degrees celcius. You may brush the balls with an egg wash and add toppings. 10. Slide the buns in and lower the temperature to 185 degrees celcius. Bake for 8-10 minutes until they turn brown. 11. Remove the buns from the oven and let them cool.